Eastlands Court Business Centre has been offering a first rate business location and serviced office facilities since 1988. So whether you are establishing a regional office in a new area, or a young business looking for your first premises, we offer accommodation without property leasing and all the other high costs. Office accommodation also includes free parking facilities. 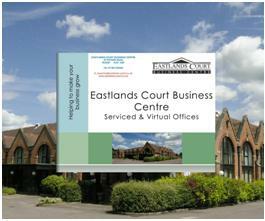 Eastlands Court also offers Virtual Office services, enabling you to establish your company prior to taking on office facilities.